Happy 1st Birthday Audi S4 Avant! It doesn’t sound much, but I have actually had my Audi S4 Avant for 1 year today! That is a massive achievement for me as I usually get bored and swap them. When I bring myself to changing it, I feel a bout of guilt come across. 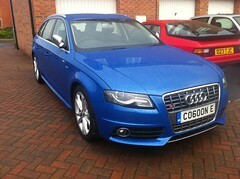 The Audi S4 is the car I have always wanted, I remember seeing it on the cover of Auto Express and reading the review. That particular magazine I sent across to my Dad. Now I own one, I don’t lease it, I own it and love it! SO here is to a few more years with it! Options include Milano Black Leather, S-Tronic Gearbox and Automatic Tinted Mirrors.